Reports that Japan is considering taking the Dokdo/Takeshima dispute to the ICJ risk further inflaming tensions with South Korea. Neither side seems likely to give in. Questions over their status keep rearing their head. 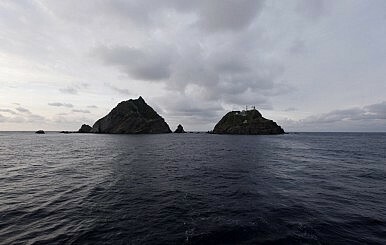 Known as Dokdo in Korea and Takeshima in Japan, this nondescript, rocky group of islets seems to garner far more attention than their tiny size would seem to justify. Yet in South Korea, year after year, every perceived slight by the Japanese ‘colonizers’ is pored over in the media in near-microscopic detail. Such incidents are usually followed by the Japanese ambassador of the moment being summoned to the South Korean Foreign Ministry for ‘clear the air’ talks, with the usual rebuke securing blanket coverage in the nightly news. In Japan, coverage tends to be a little more subtle. As claimants but not occupiers of the islets, moves to bolster Japanese claims usually involve the publication in school textbooks of the country’s rights to Dokdo/Takeshima. And few other moves rile the Koreans in quite the same way. And, just as the two can’t agree on a name for the islets, they also can’t agree on the name of the sea that surrounds the area – the Koreans refer to the body of water separating their peninsula from Japan as the East Sea. For the Japanese, it is the Sea of Japan. But more recently, the two sides have grown increasingly petty. First, the Japanese government barred officials from flying with South Korean national flag carrier Korean Air in protest at the airline’s flyover of the atolls – during which the aircraft used to launch the Airbus A380 into the company’s fleet reportedly tipped its wing at Dokdo/Takeshima. In response, the Korean government said it would ban a planned trip by Japanese lawmakers to the nearest sovereign territory, Ulleung-do, which was supposed to be part of a fact-finding mission over the dispute. Few observers would have been left in any doubt as to the message behind the flyover. Yet, the Japanese reaction was widely interpreted as unnecessary. Indeed, the Koreans said as much officially. ‘The Japanese measure, regarded as a sort of sanction against a private company, can hardly be understood,’ South Korean Foreign Ministry spokesman Cho Byung-jae told a gathering of reporters. Japan’s Future in the BalanceBuilding a New DPJJapan’s Political TremorsIf Japan had Channelled FDR...Japan’s Immigration Policy: Turned Corner or Cul-De-Sac?